3000 Miles To Graceland was financed by Franchise Pictures and the German based Intertainment. Intertainment sued Franchise in December 2000 for fraudulently inflating the budgets for their movies, so that Intertainment ended up shouldering more than the 47% of the production costs they contractually agreed to cover for a huge slate of Franchise pics. Franchise head Elie Samaha would make phony deferments called “approved overages” that were made up charges — for example, on this picture, he approved $14.5 million in overages to go to “cast — SAG” and $1.8 million for “co-stars — SAG.” With the fake overages, Franchise reported the budget to Intertainment as over $60 million, but the actual price of the film was finally revealed to be $47.4 million. Intertainment successfully sued Franchise and Samaha for $77 million and wiped out the scummy company in 2004. Before that judgement was handed down to Franchise, Morgan Creek also sued the company, as they had acquired domestic distribution rights in 1998 for eight Franchise films — “The Whole Nine Yards (Franchise’s only hit movie),” “Battlefield Earth,” “Art of War,” Get Carter,” “The Pledge,” “3000 Miles to Graceland,” Angel Eyes” and “Heist.” Along with a distribution fee, Morgan Creek would receive 15% of the film’s profits and they would have a right of first refusal on distributing the movies. Franchise never paid out any money for “The Whole Nine Yards” and they never offered Morgan Creek any other additional films to accept or pass on. After the movie wrapped production, both Kevin Costner and Kurt Russell were given the right to form an edit of their own and the two versions would go before test audiences. Costner’s cut tested higher and it was dated for release February 23. Both leads had their star wattage dim over the past few years, as Costner had not had a hit in years and Russell had been off the big screen since the big budget fiasco Soldier (1998). 3000 Miles To Graceland received bottom of the barrel reviews and the only other opener that weekend was Monkeybone. This was not one the best weekends Hollywood had to offer audiences. It placed #3 for the weekend with a poor $7,160,521 — when Hannibal led the frame in its third weekend. Audiences gave the pic a toxic C cinemascore and it sank 56.6% to $3,110,377 the following weekend and then took a 60.6% third frame nosedive to $1,225,337. 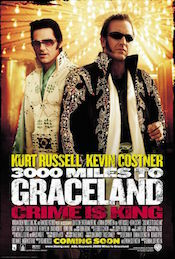 3000 Miles To Graceland bombed out of release with only $15,749,959. Domestic distributor Warner Bros, would see back about $8.6 million after theaters take their percentage of the gross, far below their P&A expenses. This commercial disaster was dumped straight to video in the UK and many smaller markets and despite being financed with German coin, it grossed just $554,411 there. The offshore cume was a mere $2,970,216.